Country side drives Kathmandu – Pokhara – Kathmandu. Scenic views of Mountains and Landscapes. Melodramatic villages and terraced farmlands. 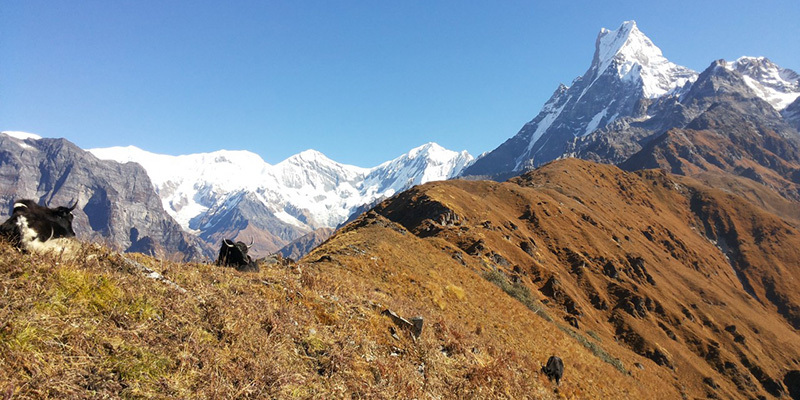 Mardi base camp trek is a newly open trekking route in Nepal . It is commonly known as Machhapuchhre Model Trek. Trekkers can enjoy eye-catching brilliant views of snow-capped mountains and diversified flora, and fauna .They can also enjoy personal look at the lifestyle and traditions of the local communities. The beginning phase of our mardi himal trek takes us to Pokhara from Kathmandu city . The journey then continues onward to Phedi town. From phedi town we start our trekking towards Pothana village. The trekkers can enjoy perfect blend of rich natural trails.They can have close look of cultural heritage of diverse ethnic groups like Gurung, Tamang, Magar, Damai, Kami, Sarki etc. Similarly they can also enjoy the magnificent views of the nearby Himalayas like Mt. Mardi, Mt. Machhapuchhre, and Annapurna himalayan ranges . Moreover, the west base camp of Mardi Himal is one of the major viewpoints of this trek. Trekkers can enjoy stunning Himalayan sceneries . Additionally, trekkers can experience the fascinating combination of rich flora & fauna, mountain forest, varied bird species etc. These are some of the supplementary attractions for all kinds of travelers and explorers during mardi base camp trek route. The Mardi river valley in Rivan & Lahachok area is an appropriate place for activities like swimming, fishing and watching various species of migrant birds. Other attractions include a tea garden and a natural cave formed by rock & limestone. Later, after reaching Mardi Himal Base Camp, we are planned to descend back down by passing through villages of Karchon, Hile Kharka, Annate Thanti and ultimately get back to Pokhara city. At pokhara city the wonderful trek ends . Even though this trek is done throughout the entire year, however it is largely recommended during the Spring months of March to May and Autumn months of September to November. Contact Euro-Asia right now to join our mardi base trek for unforgettable trekking experiences at newly discovered trails. Welcome by our representative at the airport, transfer to hotel in Kathmandu. In evening welcome dinner. After breakfast we are going to do some sightseeing activities today. As planned, we are going to explore some of the most iconic UNESCO World Heritage Sites of Kathmandu city: Swayambhunath Stupa, Boudhanath Stupa, Pashupatinath Temple and lastly Kathmandu Durbar Square and evening drive back to hotel. After breakfast drive to Pokhara. A very scenic drive lasts for about 6 hrs through the beautiful riverbanks & gorges. After reaching to Pokhara you will visit Seti george, Davis fall & Bindubasini temple. Known as the city of lakes and the starting point for trekking destination and the second largest city of Nepal is Pokhara. The Barahi temple in the middle of the big lake which is the most fascinating landmark in Pokhara and the reflection of snow-capped mountain in the lake is so serene and magnificent that you will remember it for your entire life. With the closer view of Annapurna range and Mt. Fish tail you will feel close to nature and mysticism. The other destinations in Pokhara that you will not want to miss out are Devin’s fall, Bindabasini Temple, Seti George, Buddhist monasteries and the hike to Peace Pagoda which brings you close to the nature and to the different spectrum of life style in this magnificent city. We start our Machhapuchhre Mardi Himal Trek as we take 30 minutes of drive from Pokhara to Phedi on a good road and then start our trekking activity towards Pothana which is 1950 meters above sea level. It would take around 4 hours to reach our destination. After having our breakfast, we make our way passing through beautiful forests for around 6 hours with lunch break and short stops on the way to finally arrive at forest camp which is also locally known as Koke. We start our day with a healthy breakfast and ascend gradually through beautiful landscapes, forests and river streams towards Eakle Deurali which is 3500 meters above sea level. Today our trekking activity would be around 6 hours and finally we take a rest at local tea house. Stay overnight at Eakle Deurali. Leaving behind Eakle Deurali we follow the trails towards our next site, Bagale Deurali which is just couple of hundred meters above the first one. We get there enjoying the great mountainous and landscape views. Trekking activity would be approx 6 hours today. Stay overnght at Bagale deurali. Today is the most important day of our Machhapuchhre Mardi Himal Trek when we reach an altitude of 4452 meters above sea level after making 7 hours of walking through beautiful villages. We arrive at Mardi Himal Base Camp West which offers the spectacular views of snow capped mountains like Annapurna Himalayan range, Machhapuchhre, Himchuli and others. We get the most beautiful, unique and close view of Mt.Machhapuchhre from here. Finally after rewarding day of trek. Stay overnight at Mardi Himal base camp west. From today, we start gradually descending towards low altitudes. And we trek back towards Sika Kharkha today. It is a beautiful pasture land with amazing views of landscapes, villages, and nearby glorious Himalayas. It will be around 8 hours of walking. Stay overnight at Sirkha Kharka. After having our instant meal, our Machhapuchhre Mardi Himal Trek descents through beautiful forests to Karchon which is 3682 meters above sea level. After 7 hours of downhill trek. As we descend further, we get to explore local cultures and traditions of Gurungs, Magars. We arrive at Samsur deurali at the end of the day. Stay overnight at Samsur deurali. The day begins with great breakfast at our tea house and we start further exploring the nature along with local cultures and head towards Hile Kharka. It would normally take around 7 hours of walk. Stay overnight at Hile kharka. Today the trail descends drastically around700 meters through relaxing forests and beautiful terraced farmlands and lovely villages. After getting completely immersed into best of nature and culture, we towards Rimdang Village after 7 hours of trekking activity. Stay overnight at Rimdang village. Today is the final day of our beautiful short and easy Machhapuchhre Mardi Himal Trek and we trek for around 5 hours from Rimdang village to Annate Thanti. From there we drive for half an hour on private vehicle towards scenic lake city of Pokhara. Have breakfast in Pokhara and drive to Pokhara from Kathmandu. Lunch on the way to Kathmandu. After breakfast transfer to the airport to fly to onward destination. 11 Days trek as per program with English Speaking Sherpa Guide and porter. Any cost items not mentioned in cost includes clause.